The charming historical centre of Leipzig. 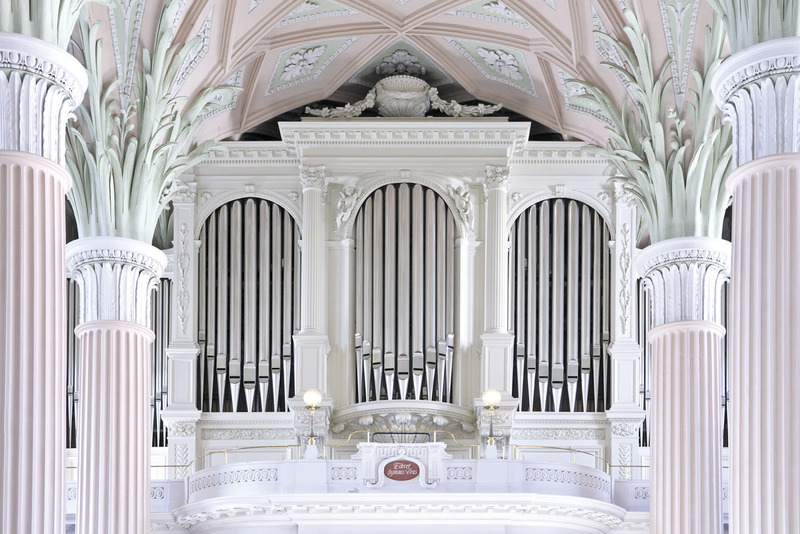 The elaborate organ design in Leipzig's 18th-century St Nicholas Church. 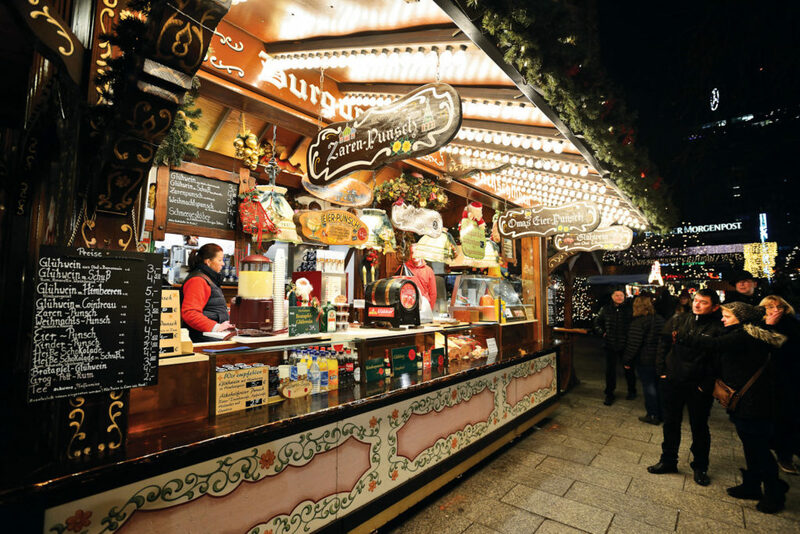 Food stall at the Christmas market in Charlottenburg, Berlin. 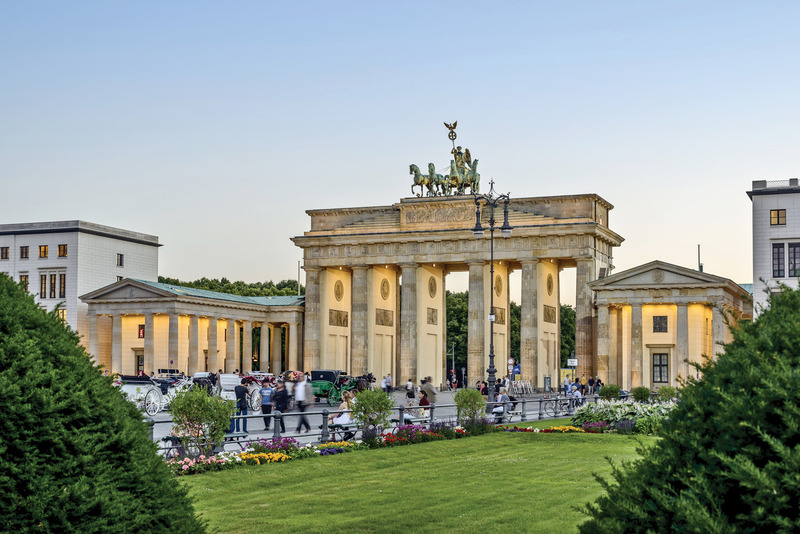 Berlin's iconic 18th-century Brandenburg Gate. 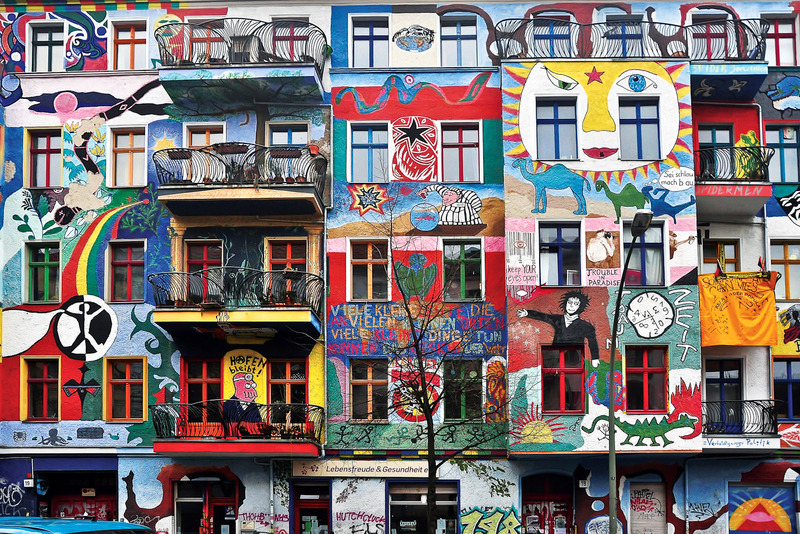 A splash of colour on houses in East Berlin. 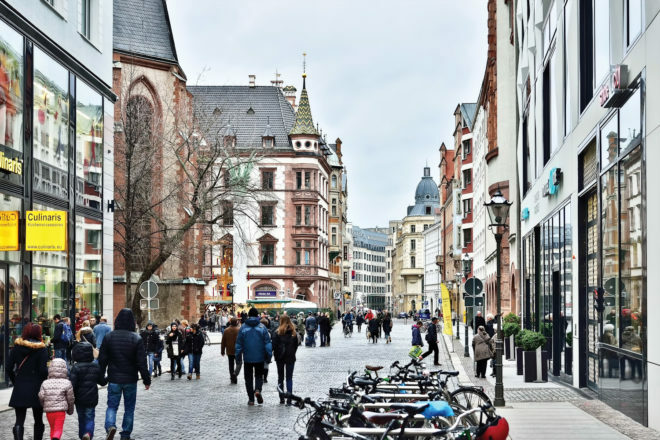 From Berlin to Leipzig, IT reader Michael Azize explores Germany’s historical depths and cultural icons. First, the ridiculous. I wasn’t surprised to find that the national food of Germany is bratwurst (sausage), but I was amazed to discover that the most popular sausage in Berlin seems to be the currywurst. This is grilled sausage smothered in curry-flavoured tomato sauce and sprinkled with curry powder. Talk about making a wurst thing bad! However, the non-touristy German restaurants serve up hearty, simple, tasty meals at a good price. The elaborate organ design in Leipzig’s 18th-century St Nicholas Church. The Siegessäule (Victory Column) in Berlin marks the unification of the previously disparate and warring German-speaking people under Prussian control; you might remember it from the movie Wings of Desire. It is simple, stunning and awe-inspiring. The Brandenburg Gate is also magnificent and the light show that accompanies it at night quite remarkable, although the effect was ruined somewhat by a busker breaking into the Harpo song Movie Star. Fawlty Towers told us not to mention the War, but that does not seem to be a problem for the Germans, whose museums and memorials are very frank about the nation’s conflicts. The massive and impressively detailed German Historical Museum starts with the Celts and continues through to the Holy Roman Empire, the hegemony of the Saxons, the separation of the German states, the rise of Prussia, the two World Wars and the descent of the Iron Curtain. Nothing seems to be left out and nothing was shied away from. Other museums go into the Holocaust and political and social oppression under the Nazis and communists in great detail. The Checkpoint Charlie Museum is cramped and chaotic, but its message is clear, and includes amazing true stories of escape from the East. My favourite is about a man in West Berlin who was separated from his girlfriend on the East side when the wall went up. He got a Swiss girlfriend that looked like his East Berlin girlfriend, took her to East Berlin, stole her passport, took his East German love to the West and gave the Swiss a miss. She eventually got out and the guy spent time in gaol for the passport theft. Just outside the capital is Potsdam, where Frederick the Great built his main palace and retreat, the gardens of which are a spectacular sight. It almost makes you glad there were royals to do such things, provided they then disappear so we can poke unhindered around their palaces. Before leaving the surrounds of Berlin, a note on its bars. The beer is very good but served only mildly chilled in very tall glasses with two inches of head; smoking is rampant and every German seems to know every other German. The Google directions to my hotel were: catch a train two stations and walk for 25 minutes. Better instructions would have been: walk outside, take the No. 5 bus for 15 minutes and the hotel is around the corner. It could be argued that Leipzig was the starting point for the downfall of communism. Peaceful mass protests following Monday prayers at St Nicholas Church soon drew crowds of 320,000 from a population of half a million. To their credit the authorities did not turn to violence to stop them and before long the protests spread to Berlin and the rest is history. Leipzig was bombed heavily during the Second World War, but it shows few of the scars from that. The city centre has the same stores as any Western city but it is rendered quaint by the cobbled streets, old buildings and the many plazas. When I visit it seems to be holding a festival of bad haircuts with mullets, fruitbats, mohawks and combinations of them all in abundance. The two must-sees in Leipzig are the Bach Museum and the little-known Monument to the Battle of the Nations. 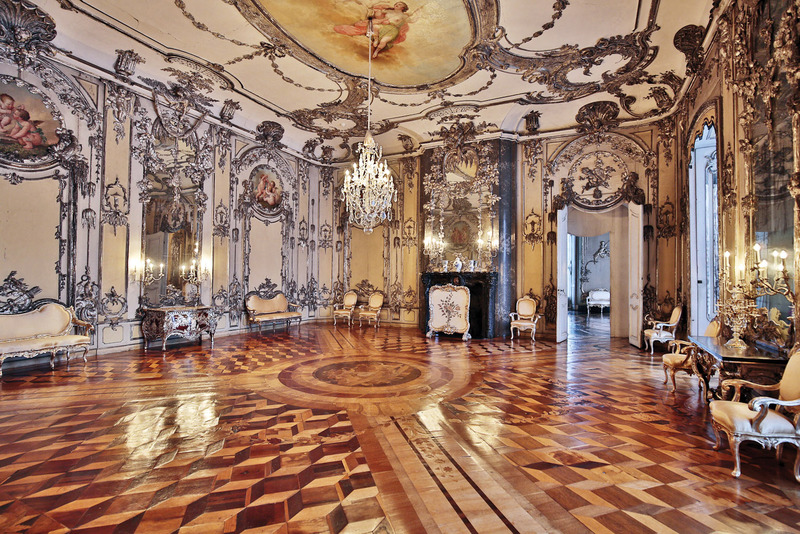 The Bach Museum is an elegant and tasteful building, filled with music and light. I do not claim to understand classical music (though I know that strictly speaking Bach is baroque, not classical); I don’t even know what I like, but this is heavenly stuff and all you really need is a willingness to open your ears. In the Battle of the Nations, for three days Napoleon’s heavily outnumbered French force, supported by the German Confederation of the Rhine, fought a combined Russian-Prussian army. It ended in a stalemate, but coming on the heels of the disastrous Russian campaign, Napoleon lost most of central Europe and his mystique. The allies were encouraged to invade France and he was sent into exile on the island of Elba. The monument lives up to the scale of the events it commemorates. Pictures barely do it justice, much like many things in this part of Germany, including the currywurst!